Here’s a bit of a personal story: When I was a young kid, one of my biggest fears was having someone poking the eyes out of my talking, battery-powered toys. Now, I had a Talking Mickey Mouse — you could put a cassette tape in him, and he’d tell you a story. But most of my elementary school friends had a Teddy Ruxpin, the lovable teddy bear who similarly chatted with children through his questionably loud, animatronic mouth. Teddy Ruxpin was one of the best selling toy of 1985 and 1986, so there’s a good chance you had one yourself. Teddy was love. Teddy was life. And Teddy, just like my Mickey, was fragile. If you saw one Teddy Ruxpin who had his eyes poked out, that was enough to tell you that this toy could go from comforting to horrifying in five seconds flat. Thankfully, Teddy is back and better than ever — seriously. Now owned by a company called Wicked Cool Toys, it seems like nervous children of today won’t deal with my Ruxpin-based paranoia. That’s because Teddy’s eyes are one of the things that got a complete makeover. Oh yes. 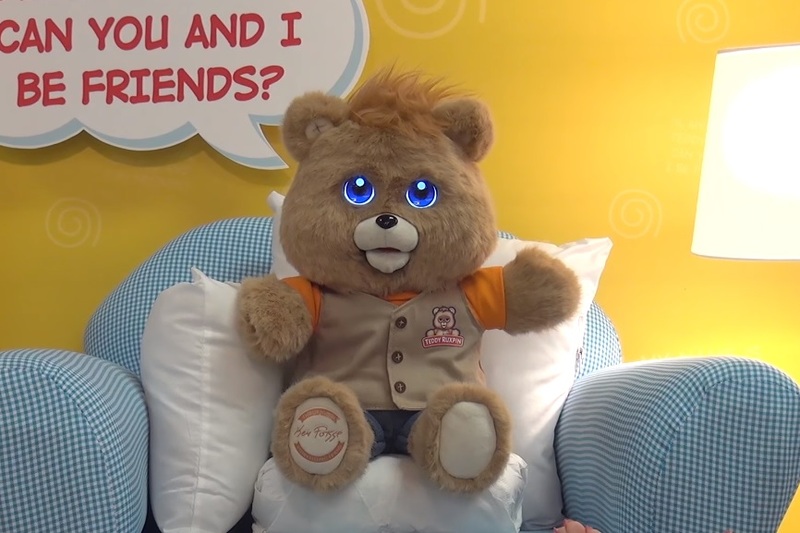 Teddy Ruxpin’s eyes are now LCD, and they’re absolutely glorious. Seriously, Teddy has gotten totally more expressive based on this change alone. And since he was marketed as the “best friend” of toys, it’s an important upgrade. Of course, the Teddy of today also isn’t carrying a cassette player in his back. As it’s 2016, he has 4 GBs of onboard storage. He’s able to partake in singalongs, can connect to his very own smartphone app, and doesn’t weigh 9000 pounds. Teddy’s makeover is pretty similar to the Furby makeover that also happened this year. Now, the video above is technically just showing the prototype — in fact, he’ll be available to buy in August of 2017. But that’s okay, since we’d prefer our Teddy Ruxpin with minimal kinks and bugs.